We headed to Brecknock Park after our quick (and somewhat disappointing) stop at Loblolly Acres this weekend. This is one of our go-to parks, and it is one of the largest, most well known in the Dover area. I’m sure many of you have heard of it and maybe even visit there frequently, but I am going to encourage you to take a closer look the next time you go. The highlight of this park is of course, Picadilly Castle. This huge wooden play structure is unlike any other playground in the area as far as I know. A great feature is the fence surrounding the play area to keep small kids contained with only one way in and out. There is a toddler area complete with baby swings, a miniature wooden climbing structure with small slides and…a sand box. If you don’t want your kids to go home with ears and shoes full of sand, steer clear of that spot! If you are able to make it past the castle, the park has a lot more to offer, including bathrooms! Behind the bathrooms you will find a butterfly garden filled with native plants and a small pond that is great for frog spotting during the warmer months. During the colder months, the garden is a bit bare but that doesn’t mean there’s nothing to see. 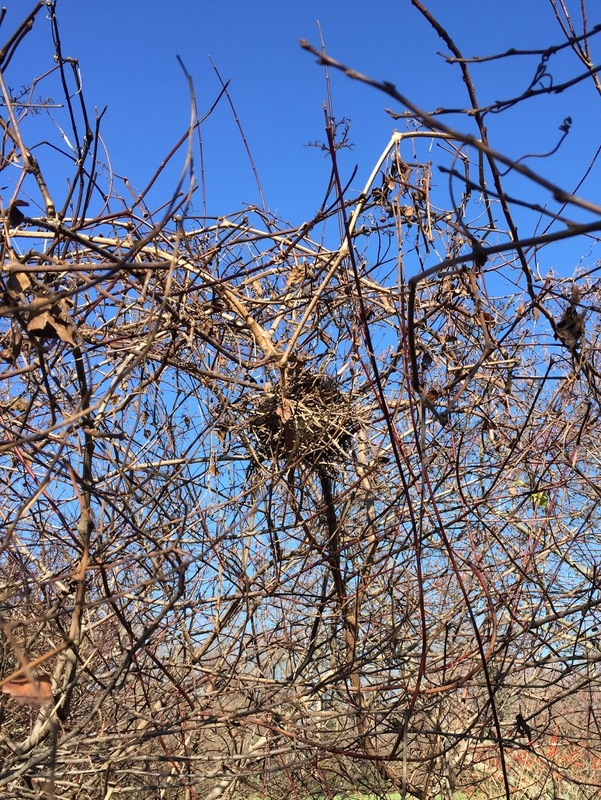 This is the perfect opportunity to look for bird nests in the shrubs which were cleverly hidden when the plants were leafed out. D enjoyed finding two of them in this garden and then continued his search as we made our way in to the woods. We headed toward the nature center, which was not open during our visit, and began our walk on the nature trail. The trail isn’t a loop, but we figured out how to make it one. If you make a left on to the trail at the nature center, then make the second right on to the path that follows the creek, you can walk along there for awhile until there is a small trail up the hill that joins the two paths that run parallel to each other. You can then walk back on the “upper” trail to where you started at the nature center. As we walked along the “lower” trail, I noticed that there were quite a few uprooted trees. I’m guessing that the moist, swampy ground didn’t anchor the roots of the trees well so they toppled over. Their loss is your gain, because now you can show your kids something that they normally wouldn’t have the opportunity to see. Explain to them how the roots of the tree absorb water and nutrients from the soil, which are then transported to the leaves where energy is made from sunlight during a process called photosynthesis. Expect a lot of “whys” and “hows” from them after you tell them that! You can see how far and wide the roots spread underground once the tree has fallen over. Sometimes the root mass will be taller than your kiddo! It would also be fun to find various sizes of (standing) trees on your walk and try to guess how far out their roots are underneath your feet. …and this is what it looks like under the soil! Unfortunately, due to the popularity of this park, it seems as though it attracts a wide variety of people, including those who are not as environmentally respectful as we are. 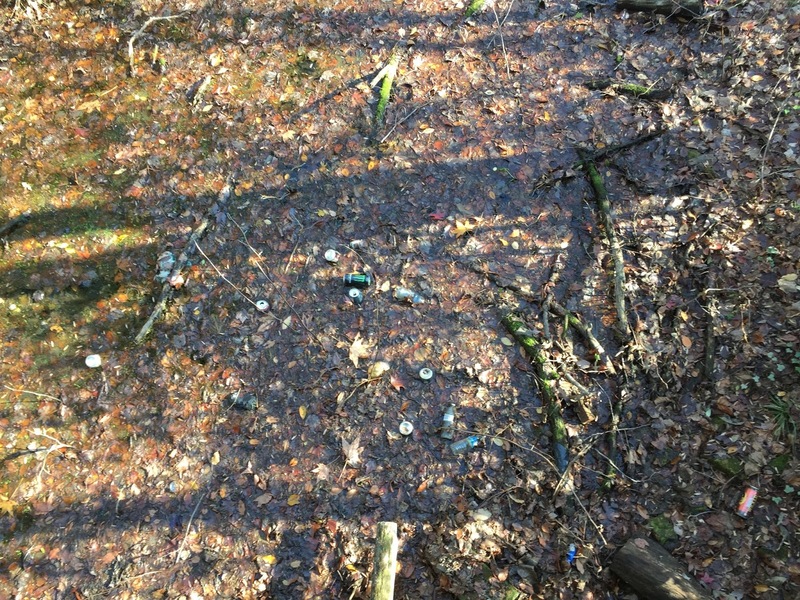 Every time we visit here, I come across a lot of trash, even in the castle area. There are no trash cans at Brecknock which exacerbates the problem. It is a bit of a turn off for me, especially with curious little ones that want to pick up everything they see. Now that D is a little older, he understands the “litterbug” concept and knows that it isn’t good to leave your trash behind so this may be a good topic to bring up with your kids as well.